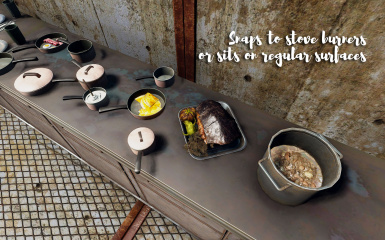 Snappable kitchen parts with containers, usable stove for cooking and sink for drinking water. 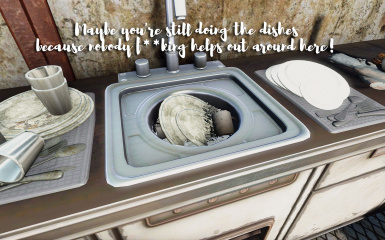 Tenpines Bluff Little Village OPTIONAL if you want change things (not needed). 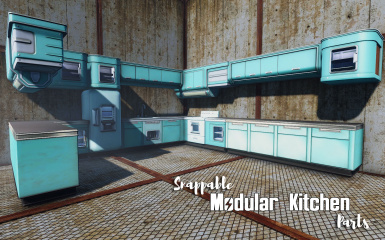 Wasteland Outpost - Abernathy Farm blueprint Default or No Perks version, i used the default one. 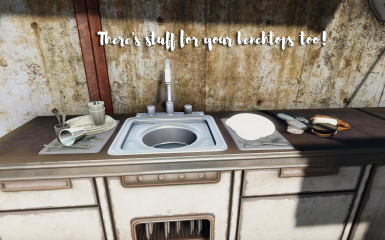 Wasteland Outpost - Tenpines Bluff blueprint Default or No Perks version, i used the default one. 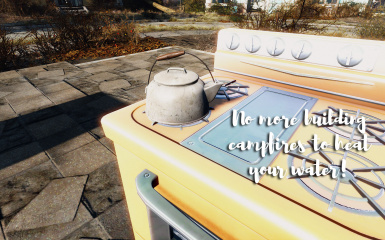 As of late April 2018 Damanding has become the caretaker of this mod and will handle all permission requests instead of Evanpox. 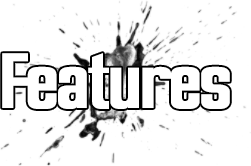 Having Nexus donations and/or donations points turned on on your mod that uses assets from us is acceptable provided our content is not the majority of your mod or you've added a significant amount of transformative work. Patreon advertisement is also allowed as long as our assets are not the majority of your mod. If you aren't sure what qualifies on this point feel free to double check with us. 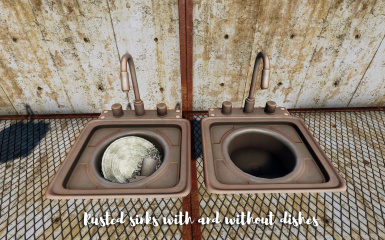 You may never sell our work to Creation Club or put it behind a paywall of any sort. Evanpox's original permissions statement: "Just ask me first-- the answer will most likely be yes; I just think it's polite to ask." 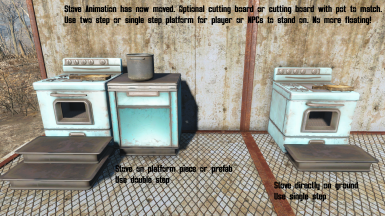 Steve40 gets mad props for generously offering versions of cabinets with a back side and other fixes that the vanilla meshes did not have. 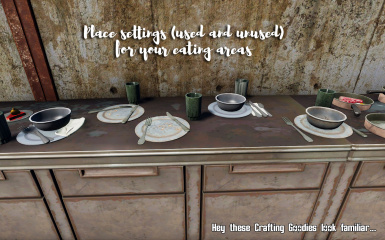 Go check out his Better Cooking Stations and other mods! 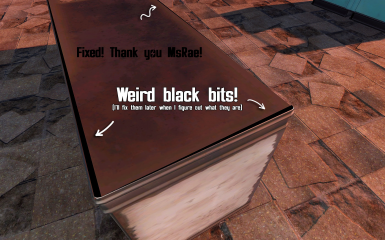 Many thanks also go to MsRae for fixing the black spots (bad vertices) on several meshes and for adding collision to the kitchen mixer (originally intended to snap on). Check out her mods! 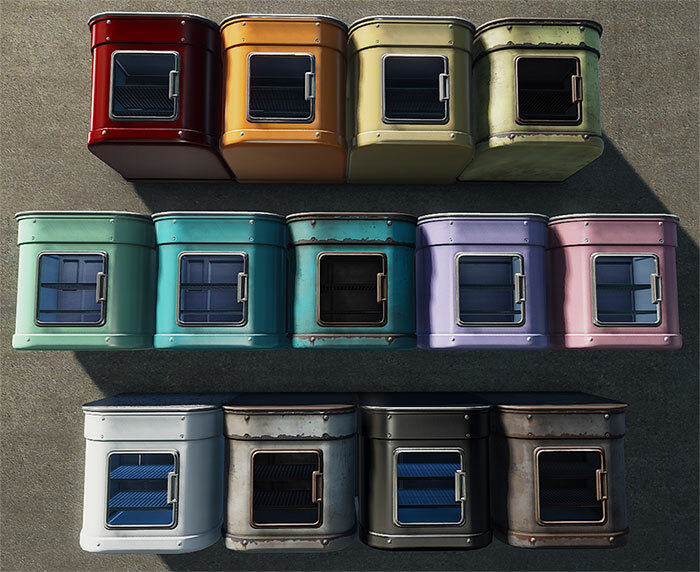 Fixed the full prefabs so that they will now build up close to a wall! 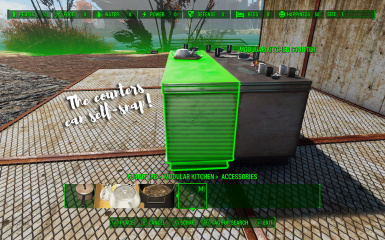 Renamed most items to be more descriptive for example "Blue Counter" instead of "Modular Kitchen Counter"
NO PERKS version optional files. INSTALL THIS ONE OR THE REGULAR ONE, NOT BOTH. For issues or permission to use this material, please contact Damanding﻿ instead of Evanpox (retired). 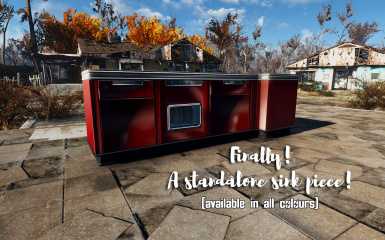 Build kitchens in your settlements with ease, using the Modular Kitchen! 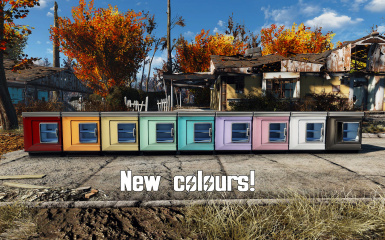 Parts snap together for ease of use, and come in thirteen* matching colour schemes to blend in or stand out from your settlement as you please. 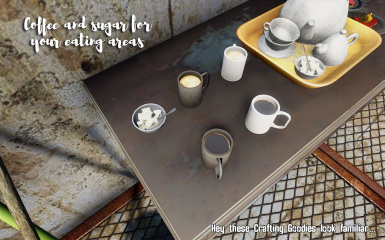 Contained in a custom workshop menu for your convenience! I cannot recommend the use of Place Everywhere highly enough! 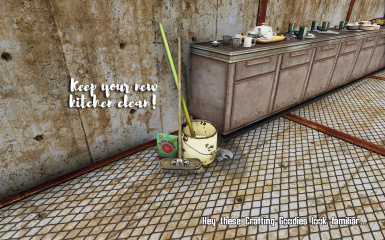 You'll get a billion percent more out of your game (and this mod). 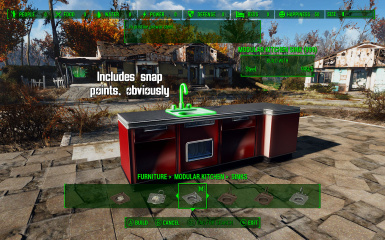 Usable, fully-functional, working kitchen stove. 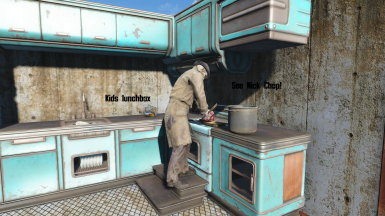 Do your cooking in the kitchen, like a civilized wastelander. 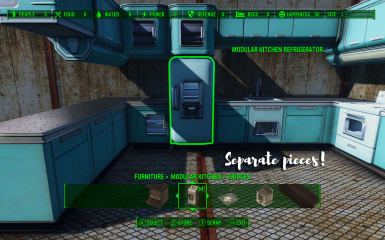 Matching refrigerator for storing food (or whatever, I'm not your mum). 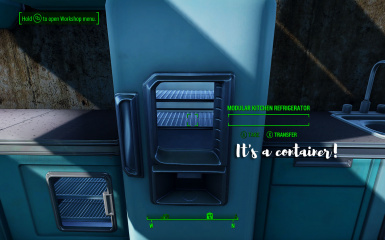 It's an unrestricted container, so you can put anything in it-- not just food. 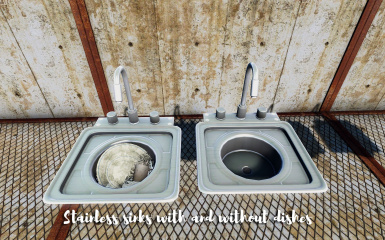 Sinks with running water. Restore health in a hurry with drinking water direct from the sink! 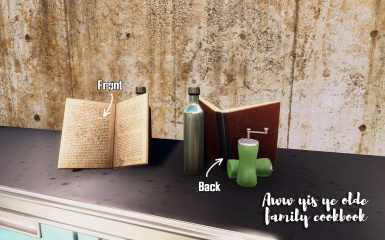 -- Optional resource version also provides 5 water for your settlement. 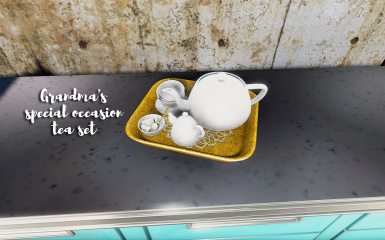 The main kitchen set-up. 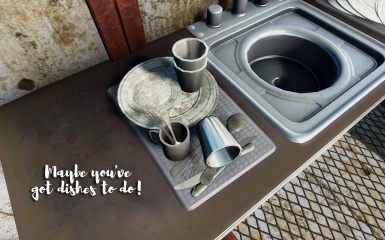 As seen in your pre-war house-- with spaces for you to snap in a sink, stove and fridge of your choice. 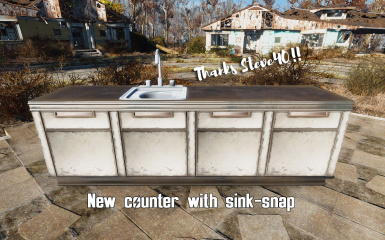 Three additional counters. 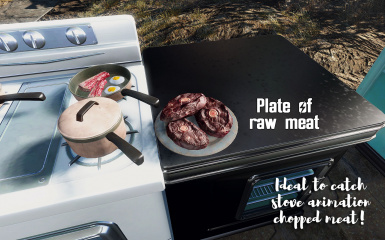 These will snap to each other, to themselves, and to the main kitchen piece. 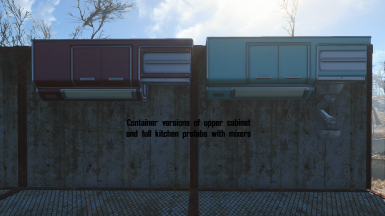 They're also containers. 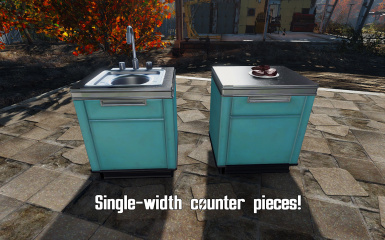 One of them has a snap point for a sink! 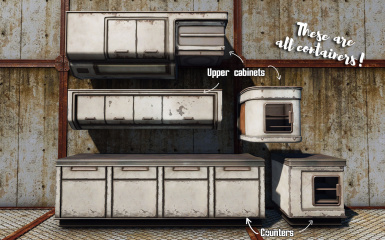 Three upper cabinets. 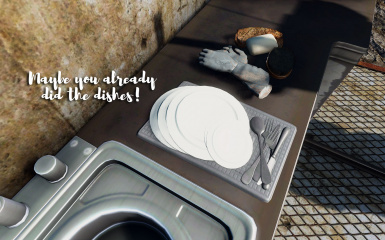 These will snap to each other, to themselves, to the walls, and to the main kitchen piece. 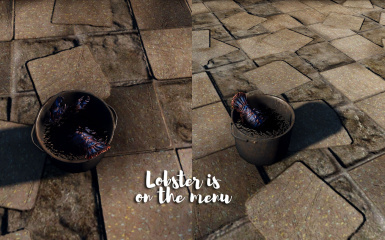 They're containers too! A cabinet platform. 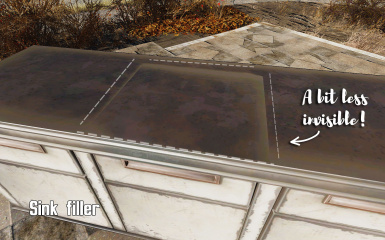 In case you want to have your fridge or stove separate to the kitchen, but want to keep with the aesthetic. They'll snap to the other pieces. 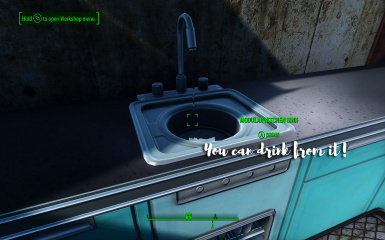 A sink filler. In case you decide that sink hole would be better served as counter space. 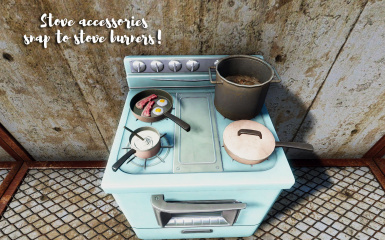 Some kitchen-themed accessories. 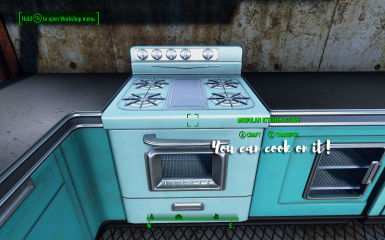 There's cookware that snaps to the stove burners and general clutter. 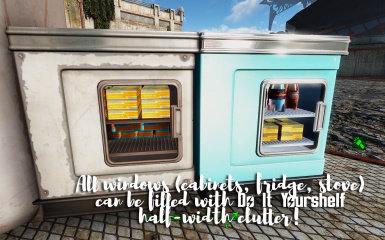 Best of all-- all of the windowed parts of the cabinets are Do It Yourshelf compatible! 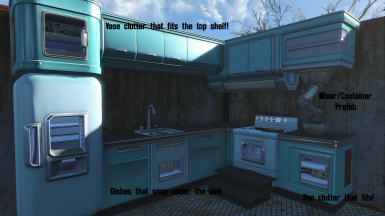 You can fill your shelves as you see fit! 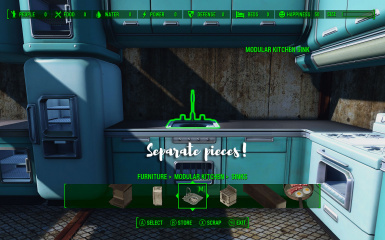 All items are located in the Modular Kitchen menu under Furniture. If you don't know how to do a manual installation, you probably shouldn't (though that has never stopped me before). Extract the .7z file and add the esp and 2 ba2 files to your Data directory. 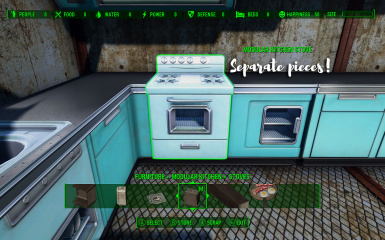 Now made simple thanks to Settlement Menu Manager, no more unistall chem needed! Updating to new version: Uninstallation song-and-dance is unnecessary if you're just updating. Shut down the game, delete the old file from your mods, install the new file, and start the game. As long as you don't run the game between deleting the old version and adding the new version, you won't have any trouble. 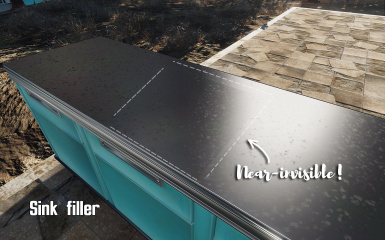 Changing from "regular" to "no perks" or vice-versa: You will need to completely uninstall the version you are currently using before using the new version. 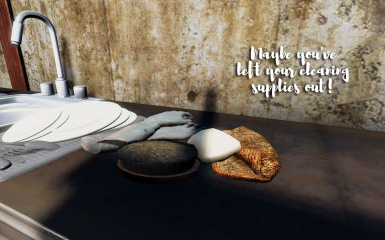 Be sure to empty ALL containers before uninstallation or you will lose EVERYTHING in them. 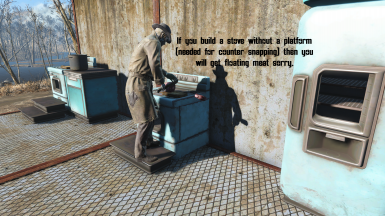 You will need to rebuild with the new version you've installed. Full integration with Do It Yourshelf. 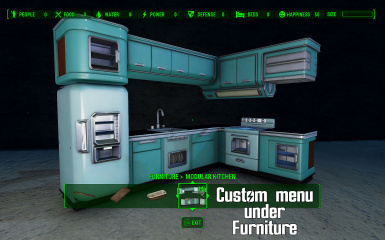 Should be fine with other mods that don't edit the vanilla Furniture menu. 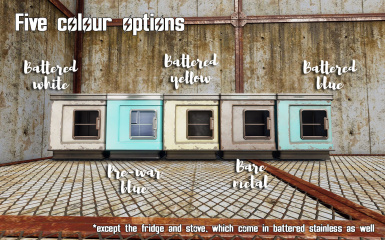 Potential conflicts with other mods that do edit the vanilla Furniture menu (I've not had any trouble with the ones I use). 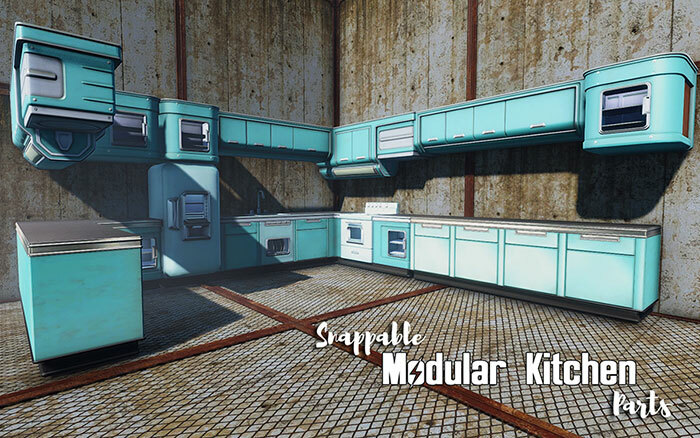 Anything that changes the texture of the kitchen cabinets will affect parts of this mod. 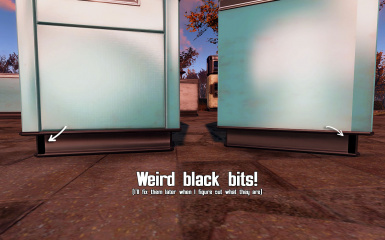 Installing both "regular" and "no perks" versions of the mod causes clusterfucks. You've been warned. INSTALL ONE VERSION ONLY. 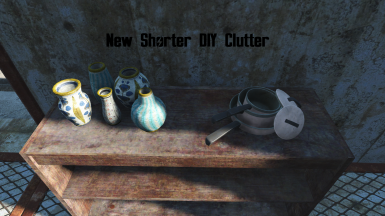 Some of the DIY clutter doesn't fit very well. Модульная кухня - Russian translation by Vasabi90. 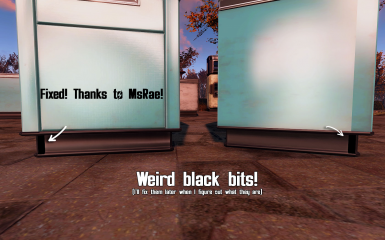 Uploaded at gamer-mods.ru with permission and thanks. Version 1.0 DAmanding took over, check the changelog tab.